Hats off to McWane Ductile Eastern U.S. Sales Engineer Roy Mundy, who was appointed to the national American Water Works Association’s (AWWA) Utility Management Systems and Business Practices for Operation and Maintenance Standards committees. Committee members are responsible for providing technical expertise in the development of standards for the water, wastewater, and reclaimed water utility industry recognized around the country. Candidates must demonstrate subject matter expertise, have knowledge of the standards development process, and be committed to active participation. Roy certainly qualifies, and we congratulate him on his three-year appointment! Mike Dodge, VP of Sales & Marketing for McWane Ductile, is pleased to announce that McWane Ductile Marketing and Specifications team members Mark Niewodowski (LEED AP and National Manager of MASD), John Johnson (Western Regional Sales Engineer), Roy Mundy, P.E. (Eastern Regional Sales Engineer), and Ken Rickvalsky (North American Product Engineer) have received ENVISION Sustainability Accreditation from the Institute for Sustainable Infrastructure (ISI). Envision is an Environmental Sustainability Rating System for Infrastructure Planning, Design, Construction and Operation. It was developed by the Institute for Sustainable infrastructure (ISI) and the Zofnass Program for Sustainable Infrastructure at the Harvard University Graduate School of Design. The Institute for Sustainable Infrastructure was founded by the American Public Works Association (APWA), the Association of Civil Engineering Companies (ACEC), and the American Society of Civil Engineers (ASCE). It is often referred to as the LEED for Infrastructure as ENVISION. The Envision Rating System is used to evaluate, grade and give recognition to infrastructure projects that provide progress and contributions to a sustainable future. “The purpose of Envision is to initiate a systemic change… to transform the way infrastructure is designed, built and operated” – William Bertera, Executive Director, ISI. At McWane Ductile, we are proud to know that ductile iron pipe provides a positive contribution to creating sustainable infrastructure and is a vital part of Building Iron Strong Utilities for Generations. Justin, Rich, MDNJ District Manager Jeff Houser, Tom, Alan, Tony, Kirby and Paul. 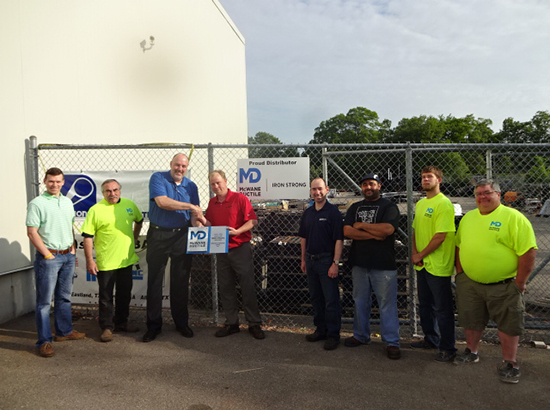 May 27, 2015, marked the day for the folks at Ferguson Water Works in Canton, Massachusetts, to receive the first ever McWane Ductile Iron Strong Award for sales in 2014 that exceeded 1 million dollars! Ferguson-Canton will be recognized as the first McWane Ductile-New Jersey (MDNJ) distributor in the state of Massachusetts to receive this award. The group appreciated this most prestigious award and look forward to joining this club again in 2015!